Estimate lengths of everyday objects. Convert between decimal and scientific notation. Make comparisons of the size of numbers expressed in both decimal and scientific notation. Before the lesson, students work individually on an assessment task that is designed to reveal their current understanding and difficulties. You then review their responses and create questions for students to consider in order to improve their work. After a whole-class introduction, students work on a collaborative task, matching measurements expressed in decimal and scientific notation. These are then matched to everyday objects. 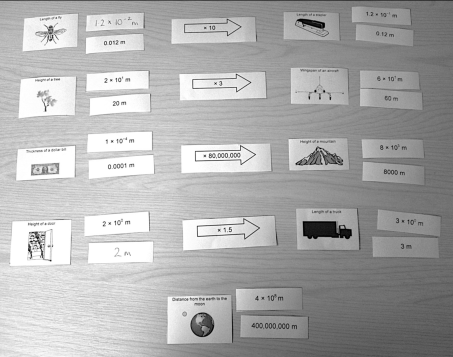 Students then make comparisons between the objects by investigating the size of one object in relation to another. To end the lesson there is a whole-class discussion. Each student will need a copy of the assessment tasks Size It Up and Resize It Up!, a mini-whiteboard, a pen, and an eraser. Each small group of students will need Card Set A: Measurements, Card Set B: Objects, Card Set C: Comparisons (all cards cut out before the lesson), a large sheet of paper, and a glue stick. 15 minutes before the lesson for the assessment task, an 80-minute lesson (or split into two shorter lessons), and 15 minutes in a follow-up lesson (or for homework). Timings given are only approximate. Exact timings will depend on the needs of the class.